Keone Kela is an American professional baseball player who plays in the Major Baseball League (MLB).As of 2019, Keone Cole Kela currently plays for the Pittsburgh Pirates as their Relief Pitcher. Keone Cole Kela has played for other teams like Texas Rangers. As a Relief Pitcher, Keone Cole Kela reportedly earns around $3,175,000 as his yearly salary from Pittsburgh Pirates. Further, Keone Cole Kela has an estimated net worth of over $5 million. Keone Cole Kela was born to parents John Kela and Shannon Kela in Los Angeles, California, USA, on April 16, 1993. He is American according to his nationality and belongs to the ethnic white group. In addition, Aries is his star sign. Keone joined Carson Senior High School in Carson, California and later graduated from Chief Sealth High School. After that, he played baseball for the Everett Community College as their center fielder. As of 2019, Keone Cole Kela has an estimated net worth of over $5 million which is same as that of Odubel Herrera. 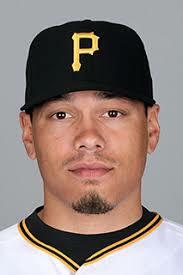 He reportedly signed a 1 year / $3,175,000 contract with Pittsburgh Pirates. The highest-paid player of the Pittsburgh Pirates is Francisco Cervelli who earns an annual average salary of $11,500,000 and the highest paid player of the MLB is Clayton Kershaw earning $34 million as an annual salary. Furthermore, the contract includes a guaranteed sum of around $3,175,000 and has an average salary of $3,175,000 annually. Keone Cole Kela so far has made earnings of $6,043,710 from his entire MLB career. The detailed information regarding the relationship/affair and probable wife/spouse/girlfriend is not disclosed on media. The 26 years old MLB player keeps his personal life low-profile and stays away from rumors and controversies and is a career-focused man. So far there is no news about his love life. His mother was only 16 years old when Kela was born and his father was only 15 years old. Although Kela was born in Los Angeles, his father's family is from Hawaii. In addition to being a famous MLB relief pitcher, Keone Cole Kela is well known in social media. The famous MLB star is 6 feet 1 inch tall in height and is not only a world-class athlete but also an attractive person. Kela began his MLB career with theTexas Rangers after being selected in the 2012 MLB draft as their pitcher. He played for over five years with the Rangers and during his time with Texas he underwent stem-cell therapy for his shoulder treatment. Later he was traded to the Pittsburgh Pirates on July 31, 2018, in exchange for Taylor Hearn and Sherten Apostel. James Rodríguez is Living Happily With his Wife Daniela Ospina, Do They Have Children?